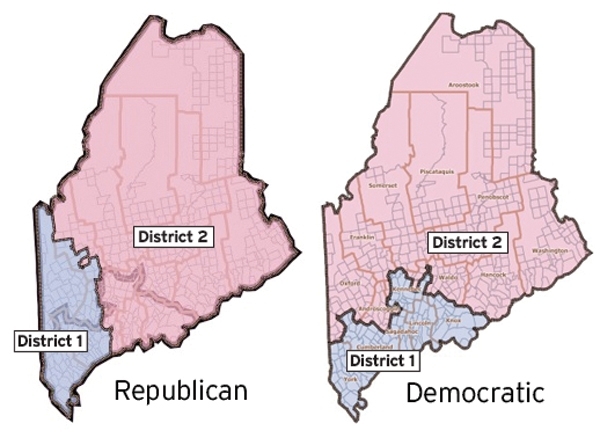 AUGUSTA, Maine — Despite repeated attempts over the last few weeks, Republicans and Democrats in Augusta have not come together on a congressional redistricting plan, setting up a legislative showdown during next week’s special session. When the dust settles, one of two plans likely will be approved by the GOP-controlled House and Senate, but neither plan is expected to get a two-thirds majority. Republicans indicated on Friday that they plan to pass their plan — one Democrats strongly oppose — with a simple majority vote, something that goes against not only tradition but also requires a temporary suspension of rules. Democrats vowed to fight, but they understand the math is not in their favor. So what does it all mean politically? Depending on the tenor of next Tuesday’s debate, it could set the stage for the 125th Legislature’s second regular session, which convenes in January. If Republicans stick with their plan, which some critics have called a radical shift designed to improve the party’s chances in the next 2nd District race, Democrats could be less likely to compromise on other matters. Gov. Paul LePage and House and Senate Republicans hope to advance an ambitious agenda that builds off the successes of the first session, but they could need the minority party’s help. The Democrats’ “Vassalboro-Gardiner plan” shifts the Kennebec County towns of Gardiner, Vassalboro, Vienna, Rome and Unity Township into the 2nd District and moves Oakland and Wayne into the 1st District. Their plan, the third option offered by Democrats, achieves the population deviation of one that Republicans said was essential. It affects about 20,000 voters and splits only Kennebec County, which already is divided between the 1st and 2nd Districts. Republicans don’t like it because it protects the status quo. The Republicans’ “Western Maine plan” moves Lincoln, Knox and Sagadahoc counties from the 1st District to the 2nd District and moves Oxford and Androscoggin counties from the 2nd to the 1st. Kennebec County would be contained entirely in the 2nd District and Franklin County would be divided between the two. Among other things, the GOP plan would shift one-quarter of the state’s voters from one district to the other and would move more than 8,000 Republicans into the 2nd District. Some Democrats have called the plan the “Kevin Raye plan” because the Perry lawmaker is rumored to be challenging 2nd District Rep. Mike Michaud in 2012. The GOP plan also would put Pingree’s hometown of North Haven squarely in the 2nd District, a move Democrats have said is unnecessary and vindictive. Raye, however, said it’s not the Legislature’s responsibility to protect Pingree or Michaud and he believes the Republican plan helps fight the “two Maines” phenomenon. Democrats, however, say the Republican plan worsens the “two Maines” problem by creating one district that is mostly urban and another that is almost entirely rural. A committee of Republicans and Democrats spent two months working on several options, only to remain miles apart in the end. Michael Friedman, a Bangor lawyer and independent who was chairman of the redistricting committee, supported the Democrats’ plan. Although two recommendations have been forwarded, the Legislature can consider any plan, even one that hasn’t been debated publicly. The same GOP-controlled Legislature this year passed a resolution proposing an amendment to the Constitution of Maine to require two-thirds of each legislative branch to approve congressional redistricting proposals. How can Republicans who supported that constitutional amendment only a few months ago now be comfortable with a simple majority? Democrats believe the Republicans’ plan will backfire. Republicans hold majorities in the Senate and House, but the margin in the House is small. If only a few members defect, their plan could be doomed. If the Republicans’ plan passes with a simple majority next Tuesday, some have speculated it would face a legal challenge. Goodall said his caucus is focused on the legislative process first. “The process right now is that if a plan doesn’t get two-thirds support, it can get sent to the court,” he said. Courts have drawn the congressional district lines in each of the last three decades and tend to favor less disruption than more. “The Republicans clearly don’t want the courts to decide this,” Goodall said.